In and Out Valet Co.
A Contractor with a wide range of valet parking experience. As well as the ability to ensure proper traffic flow through your parking areas. Extensive Owner involvement in all aspects of your contract. In and Out Valet Co. takes a hands on approach with all of it's clients. So you can always be assured that your needs and concerns are being looked at and addressed. Knowledge gained from over 35 successful valet parking contracts and a combined 40 plus years in the Valet parking business. A commitment to providing outstanding customer service. A commitment to hiring veterans and supporting the veteran communty. In and Out Valet Co. is the best choice to help get your valet parking to work smoothly and ensure a zero impact on your patrons when they visit your facilitiy. 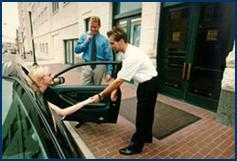 For rapid, professional and courteous Valet parking services, In and Out Valet Co. is your best choice.